Wicked Uncle: Online Toy Shop review. Recently we were invited to review the Wicked Uncle online toy shop. I say recently…. This was before we realised we were having our second baby and before the drama and upheaval of the unexpected house move, so back in the days when things were calm and a bit easier. Wicked Uncle aim to make shopping for children’s gifts that bit easier by separating their selection into various categories and age groups. They are the only website that doesn’t primarily sell to parents. The site is a gift service making it easier for aunts, uncles, grandparents, godparents, friends and other relatives to find the right gift for your child. I can normally find gifts for younger children but I do start to struggle once they get to about 6 or 7 years old so the age group selections are very helpful. They can also gift wrap for you and send directly to the recipient with a hand written birthday card and set up a reminder to ensure you don’t forget the next birthday too. When you have as many nieces, nephews and friends with children as I do this is a very handy feature! When I first viewed the website, I was disappointed to see that the toys were arranged by girls toys and boys toys. I’m really not into gender stereo types – why can’t my son play with a doll if he wants? However since that first view they seem to have added many more categories so that you can search based more on the personality of the child, eg; adventurer, brainiac, books and games, creativity, outdoorsy etc. 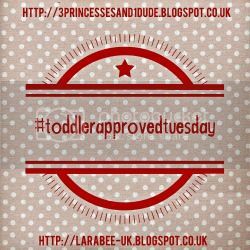 There is so much choice available that I spent days coming back to the website, adding lots of things into my basket and then trying to narrow down my selection, then seeing something else and then having to reselect to make sure I’d got the perfect gifts for my 2 year old. In the end, we chose three items.. I thought this was a good way of showing Dexter how to undo things and do them back up again, brilliant for improving his hand eye coordination and dexterity. Plus he’s rather cute. He’s been out with us a few places since we had him and Dexter seems to really like him. He can name the features such as button, zip, laces etc and also point out that Pirates hat, parrot and eye patch. Another bonus to this toy that I hadn’t considered before I ordered it, is the aid in potty training. Once Dexter had the initial ‘going to the toilet’ skills nailed, we tried to get him to become more independent with it so being able to undo his own buttons etc is a big step. 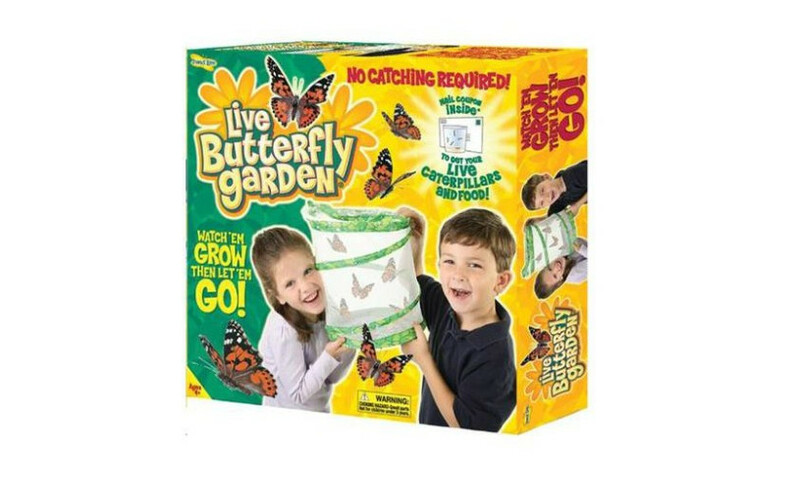 The second item we ordered and by far my most favourite is this Live butterfly garden. I’d seen this on one of my favourite blogs, MudPieFridays not long before and fell in love with it. What you receive is a pop up net, some instructions and a voucher for some caterpillars. When you are ready, you send away for your live caterpillars between the months of March and September. They come in a small glass jar with enough food to keep them going while they grow. Once they turn into chrysalides, you can transfer them into the pop up net in the garden where they will emerge as butterflies for you to release. I was so happy to find this one the Wicked Uncle website as I’d wanted to get it anyway. It’s is a fantastic way of showing the life cycle of butterflies and a fascinating project to do with kids of any age (including 32 year olds) Sadly, by the time we moved house and finally got settled enough, it was a bit too close to autumn to do this with Dexter but I can’t wait to send off for our caterpillars next year and start it. I shall be documenting the project all the way through so please look out for it. And finally the 3rd item we ordered was a tin of Glo Shooting Stars. I had originally planned to put these up in the old house. As it turned out, by putting them in the new house and making a big thing of them actually helped Dexter settle in his new room much easier than we had anticipated. In the tin is a mixture of stars, shooting stars and planets and enough sticky dots to attach them to either ceilings, walls and furniture. The ones on our ceiling didn’t seem to stay up very long and to be honest, the glow on them is a bit weak so we have since added to our collection with a different set but Dexter still looks for the planets when we tuck him in and his bedtime is just that bit more magical for it. Overall, I would most definitely recommend the products and service I received from Wicked Uncle online toy shop. Especially the way the toys are now categorised. Buying gifts for your own children is can be hard enough but when it comes to other children in your life sometimes it can be difficult to know where to begin, so this site is a big help, especially heading up towards Christmas. And the gifts even come with a pre filled thank you card so you know your present was appreciated! Disclaimer: Whilst we weren’t paid for this review, we did receive the products free of charge. All views are completely my own. New Baby gift Guide Giveaway! Ive not heard one bad review about them! Can’t wait to do them! Haha I know the feeling! It took us days to finally decide! I love the look of the butterfly farm, I kind of want one for myself! How great that the stars helped Dexter to settle into his new home! Haha the butterfly thing is secretly for me… But I’ll let Dexter look at it occasionally lol. I remember having stars like that as a kid! We have wanted to try the live butterfly garden for sooooooo long! Add it to my list of ‘really want one’!!! He he I cant wait to start it! You should totally get one!